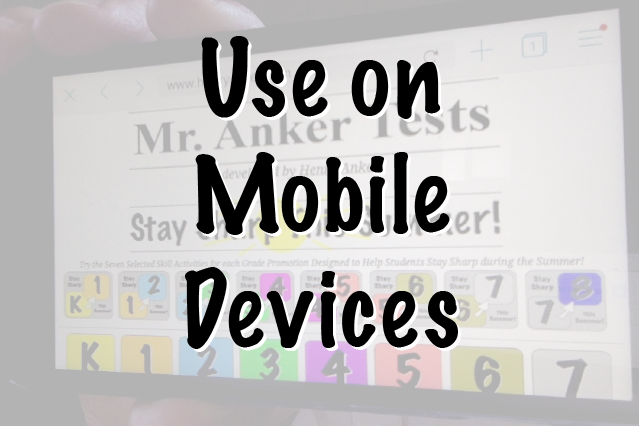 Use the Puffin Browser to allow you to use Mr. Anker Tests on Mobile Devices (tablets and phones)! Teachers & Parents: You can download the free or paid version of the Puffin Browser (below) for your device(s). Great news for iPad/iPhone/Android phone/tablet users! will be able to use most of the activities on this site just as you can using a traditional computer. Once you do this Puffin becomes your mobile browser for Mr. Anker Tests, though you may find that you get faster speeds on other sites as well. Students: Please make sure to get permission to download the app from your parents and/or teachers. Teachers and Parents: The free version of the Puffin browser does contain ads, some of which may not be age appropriate, depending on the age of the child. There is a parental warning that some ad content on their browser (usually found on the bottom of the page they're viewing) may not be appropriate for younger viewers. The paid version does not display ads, and is therefore preferred for young children. General Notes: You and your students will notice that the activities do work a bit more slowly. There is also leave-behind effect, where after making a selection in a multiple choice activity, the location of the last touch will remain selected (highlighted). Let your students know that this does not indicate that the selection is the correct choice for the next question. It may be, or it may not. More Info: A few of the activities were designed to respond to the return/enter key to confirm correct answers. When this is called for in the Puffin browser, you can bring out the iPad keyboard by dragging a finger from the right edge of the screen. This is time-consuming, and can take up a lot of screen space in the landscape (wide) mode. To keep the keyboard visible while working, rotate your iPad to portrait view (tall) where the test and the keyboard will both be visible.